It is Good Friday and thoughts turn to things related to Easter, as they should. I am not a Roman Catholic but sometimes I think they have something in some of the traditions they wrap around themselves. A few years ago (1999 actually) I visited Jerusalem and wandered around in some wonder at where I was, pausing at some distance to get this photo of the Wailing Wall. While plenty will tell you that Jesus was here or there, the fact of the matter is the current city sits high above the streets which existed in Jesus’ day. You can walk down through some excavations near the Wailing Wall and through a colonnaded sidewalk of Roman times, it all being set down 10-12 feet below the current street level. Despite the displacement in elevation you still have a powerful sense of place and occasion. I stumbled over some powerful sites in that regard. I was not on any crusade to find holy sites, since in many respects they are meaningless in terms of my faith. But you’re caught in the moment as you sit in a small, smoke stained (from years of candle smoke) cave in the Church of the Holy Sepulchre and wonder if this was in fact the place Jesus was buried. Who knows, but the possibility grabs you. And it grabbed me in a way I was not expecting at all. 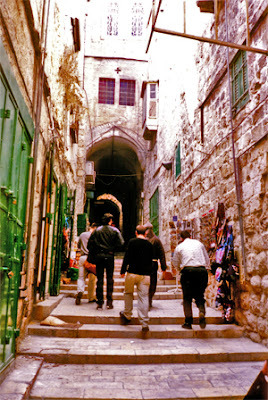 Another such site is the Via Dolorosa, Latin for “Way of Grief”. 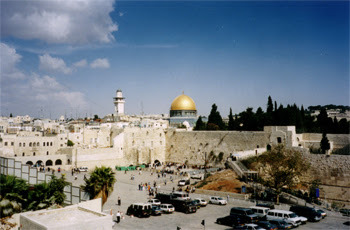 This route, high above old Jerusalem, is the supposed route Jesus took on his way to the cross. I was not prepared for the way this route struck either. I have been dismissive in my reading of history, not understanding the concept of pilgrimage at all. A quiet walk up the Via Dolorosa gave me an insight into that concept and of the emotion that could be associated with this place. I was lucky. Very few were out and about that day and I was able to amble along the Way of Grief, through shopping and markets and laundry in a meditative mood which was not tainted by any tourist crowd – it being about as busy as you see here. My only regret is being less alert to the significance of the place than I might have been if I had been raised in the Catholic church. A small price! The Easter story is an annual event that marks our secular calendar but which has little impact outside the Christian church. But even within that demographic there are plenty it does not touch. It is an historic event that remarkably stands out for the non Biblical record which captured the teachings, death and resurrection of the man called Jesus. But despite that, and the “cloud of witnesses” to these events – more than sufficient to convince a Royal Commission or any other court of our own – it fails to impact us as it should. The reason is simple I think – if we accept the evidence then we have to do something about that evidence. A somewhat confronting choice that might force us to change the way we live, so it is easier to leave the whole issue alone. But even those that accept the evidence are not always challenged by this event either. It does not always inform who we are or how we should behave. With these thoughts I approached Easter 2005 and attempted to capture something of how I often approach this celebration. Often the thought is that if I had been there I would have behaved differently. Not denied Christ. Not fallen asleep. Not followed the crowd. Then you catch yourself and discover in your own heart the truth of the matter – that you would have kept your head down. 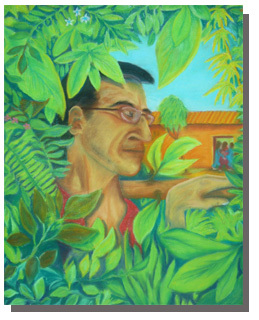 So I painted this (with pastel) image of a garden, more subtropical than Mediterranean. I might not be asleep but I am hiding nonetheless while Jesus is bundled out the garden gate to his death. I am keeping out of the way. Hiding. As timid and as careless as the next person. Which only underscores the point of course – that any life changing interest in Golgotha does not come from ourselves. It is a gift – which is what Easter is all about after all.